Rambler Punta Carretas offer Different sized rooms from private bedroom, to mixed dorms for 5, 7, 9 and 12 people. A full equipped kitchen is there ready to see the different foods that guests from around the globe will cook and share. A big living&dining room, playroom, guitar and hammock, a barbecue spot where you will taste the famous Uruguayan Asados. The neighbourhood is both residential and full of cafes, restaurants, small shops and big shops at walking distance all in a very safe environment. You will find all the you can think of, yes, all of them, including the one you are thinking of right now, and most of them have special discounts for our guests. 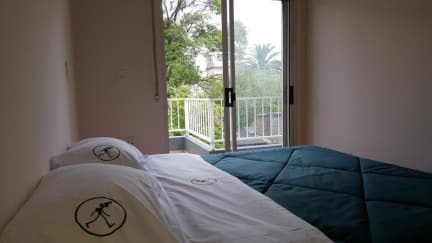 With that in mind you can spend the whole day rambling through the city knowing that everything you will need for the day or the night will be steps away from your bed. We have private and shared rooms and we offer individual and big sized lockers inside the dorms guarantee your personal belongings safety. Power outlet and reading lamp on your bed allow you to charge your gadgets batteries while reading a map or book till you drop dead on the comfy mattress. 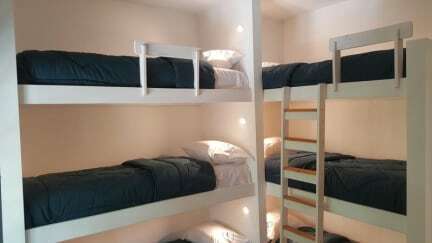 With A/C on each room you will enjoy a pleasant stay on the Rambler Hostel!